Nigeria Gists: Niger Delta Avengers blow up Escravos pipeline linking Warri to Lagos, again! Niger Delta Avengers blow up Escravos pipeline linking Warri to Lagos, again! 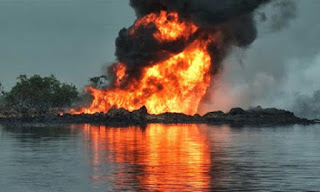 Suspected members of the Niger Delta Avengers have attacked another oil facility in the Niger Delta, blowing up the Escravos pipeline linking Warri to Lagos. Details of the attack are still sketchy with security officials declining to comment. The Niger Delta Avengers, which has claimed responsibility for recent attacks, has yet to comment on the attack. The group had attacked the pipeline in February. The damage is, however, expected to worsen the country’s energy crisis, with power generation below 2,000 megawatts and oil production down to 1.4 million from 2.2 million barrels per day.